Glenn Fessler was born in Silverton in 1962, and at the age of 8, his family moved to Madras. 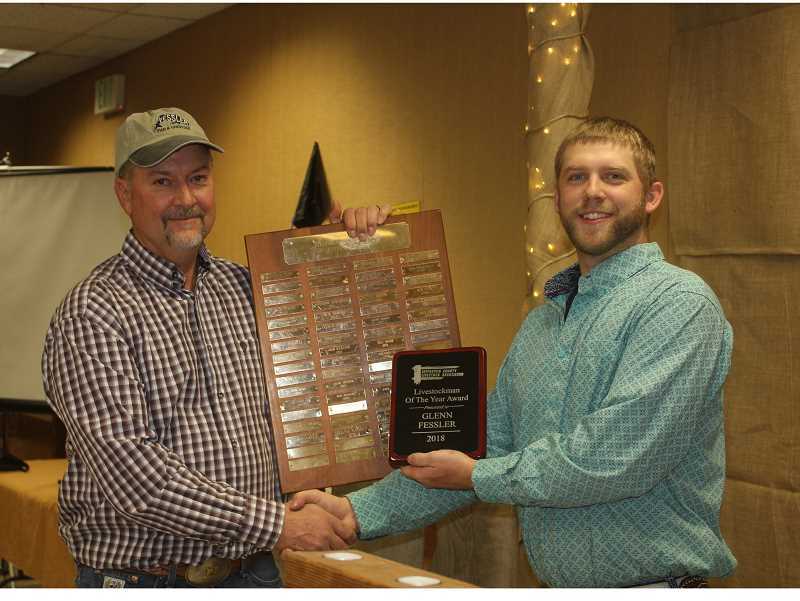 Local rancher Glenn Fessler was named the Livestockman of the Year at the Jan. 19, banquet and awards presentation of the Jefferson County Livestock Association. This marked the 67th annual banquet, which was held in the Maccie Conroy Building at the Jefferson County Fairgrounds. The award has been given yearly since 1951, with the purpose of selecting an outstanding livestock operator, who has demonstrated excellence in livestock production practices. Also, to recognize a person who has been involved in livestock–related organizations to bring enrichment to the community. The following history of Fessler was given at the event. Glenn Fessler was born in Silverton in 1962, and at the age of 8, his family moved to Madras. His first job, while going to school, was changing pipe for 8 cents a pipe. His parents bought a farm in 1977, and the love of farming and ranching captured his interest. The family grew some mint and even had their own mint still for a time. He continued to work on the farm and ranch for his parents through his school years. He participated in 4-H from the fourth grade on, showing a steer at the fair every year. The first cow he got from his dad, when he was 10, ended up dying, so he got another when he was 11, and she also died. At age 12, he was given another cow, which luckily lived, but her calf died. Finally, when he was 13, the growth of his herd seemed to go the right direction. The family farm transitioned into a larger 1,000-head ranching operation, and he continued to work hard and learn the business. Fessler graduated from Oregon Institute of Technology with a welding/fabrication degree in 1982. He bought his first 200-head marginal permit in 1990, which he still holds today. He also leased the Monroe Ranch in Grizzly in 1992, which he ended up purchasing as his home place in 2004. Building a private fly fishing reservoir on the ranch was a great way to supplement the cattle income. Happiest while driving a tractor, Fessler currently farms 150 acres of his own, and 500 more for other people, which solely consist of hay crops. Leasing a couple neighboring ranches has helped give room to rotate and utilize the grass close to home. Currently, the Fesslers summer the herd at the ridge in Ashwood, and on the grassland permit, and then bring them home to Grizzly in the winter. He runs Angus and Simmental/Angus bulls from local breeders, and calves around 50 head of heifers every year. Passing the ranching gene on to the next generation, his work crew usually consists of his young son. After many years as a bachelor, Fessler finally married in 2000. Today, he and his wife, Jeannie, have quite a herd of their own -- two sons and four daughters, with ages ranging from 8 to 25. He will be blessed with his first granddaughter in February. With all of his free time, he currently serves on the board of Gray Butte Grazing Association, and has been known to be a reliable taxi service to and from Culver.